The first Cruzbike front-wheel-drive recumbent bike arrived — nice design and the components are decent quality. Eager to build it and take it out for a ride. One of the most exciting aspects of this recumbent bike is the clearance for fat tires. We may well have a mountain bike here, folks. I’ll write more after I have the chance to thoroughly abuse it, er, I mean, ride it. 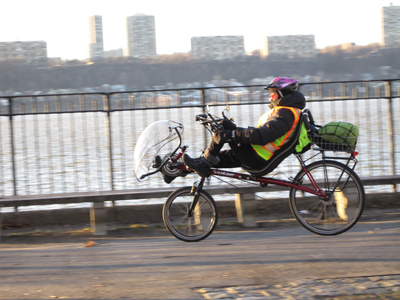 A Volae recumbent rider uses a Windwrap fairing and thick clothing to help fend off icy temps. Yesterday, Sunday, had a nice 8-hour ride in 20-18 degree F, not counting substantial windchill. Promise to post soon about cold weather clothing and the Terracycle Windwrap fairing on a Volae Century/Tour-type frame. For now, suffice to say…wear wool and carry down! …And the fairing mounted easily, traveled well with no slipping, and was easy to adjust during the ride when necessary (while wearing gloves). It sits sufficiently low compared to the handlebars on a Volae Tour (or Century) that a handlebar-mounted B&M Ixon IQ headlight lights the road w/o excessive obstruction from the faring. It wasn’t necessary to use an accessory mount to position the headlight to the sides or below the fairing. The only cold-weather induced hassle (not counting the water freezing in the water bottles) was that the derailer for the SRAM Dualdrive would sometimes stick on the Grasshopper fx. I think there was moisture in the housing that froze as we rode. It was easy to loosen up the cable as I rode by shifting to a lower gear and then back down to a higher gear but I never had the highest gear/smallest cog. No big deal, but a bit annoying. The only other time I’ve seen that was when I had actual ice hanging off the cables. Biking remains an adventure. ← Ortlieb recumbent backpack: got one, love it. But check your rack size.